There are two types of packages We Love Rugby offer. Includes 3 nights accommodation including a Category C match ticket for both the Final & Bronze Final. 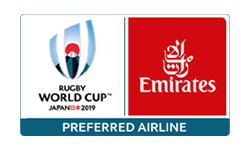 Includes 3 nights accommodation including a Category B match ticket for both the Final & Bronze Final. All of our hotels are based in Tokyo Metropolitan. Package includes Category C tickets & 3 nights hotel accommodation. Package includes Category B tickets & 3 nights hotel accommodation.